quantiFIN: Portfolio Optimization, Tangency Portfolio, CML with shorts not allowed. Portfolio Optimization, Tangency Portfolio, CML with shorts not allowed. The functions in the previous post have been updated to put in the additional constraints that no portfolio weights can be negative, that is short selling is not allowed. Unlike the case were shorts are allowed, in this case, not every desired portfolio return is feasibile when shorts are not allowed. 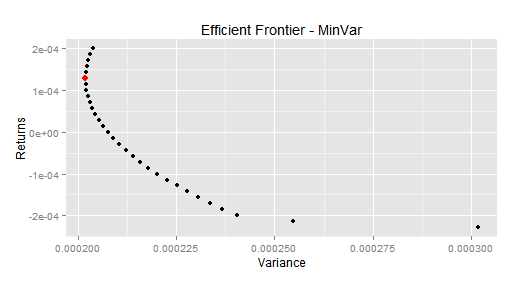 Here we search through a range of returns from -0.0005 to + 0.0002 and detect which return gives us the minimum variance. The means that are infeasible are flagged as sucn and ignored. 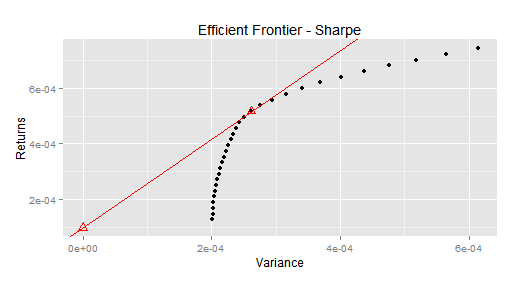 Dataframe z10 contains the range of feasible returns and the corresponding variance. The portofolio weights are printed out as follows. The first one though technically negative is very, very small. 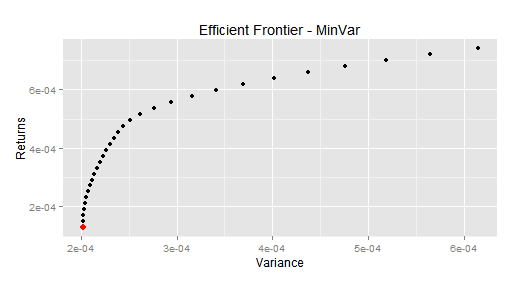 The efficient frontier is plotted, but this is not very useful because the range of returns that we have taken are "below" the minvariance point. Please note that by setting SHORTS = TRUE, this set of functions should be able to recreate the results given in the previous post. These programs can be run on StatAce, the free hosted R environment and get the same result. How long should we hold this portfolio weightage to get the expected return?